Rim and base detail on Blea Tarn Platter. The Inspiration for Edge Ceramics comes from many things, like a particular place or a moment in time. A thought process or a reaction or something seen or heard. A saturated rock surface or the quiet solitude of an isolated tarn high in the fells. A cross section of rock strata or the way the wind plays on the surface of a grass covered fellside. At the seaside or in a calming, green forest or high up on a wild windswept plateau. The frozen waterfall or the frosted bark of the Silver Birch tree. A place that was once industrialised or quarried, that is quietly being taken back by nature. Or lichen on a drystone wall or fungii colonising a dieing tree. A saturated moss coloured stone reflecting a waterfall rushing above. Inspiration can be as simple or as complex as one might wish but the result is still the same. A thought, an emotion, a vista, a movement, a sound or a reaction. Outdoor Table Sculpture inspired by Lichens and Natural Pigments. 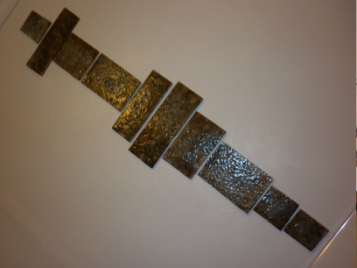 Black & silver interior Hand made tiles/Wall Art inspired by saturated rock surfaces on Shap Fell. Cobalt Blue enriched Tarn Bowl inspired by the Valley of Haweswater. The Ibis Boat Sculpture inspired by Ghormanghast, Tolkien and Baron Munchaussen. The Betula Tower Sculpture inspired by the frosted bark of a Weeping Birch tree in winter.